I used to think that the purpose of fiction was to make sense of the world. Fiction was a hypothesis about how certain people would act under certain situations. That’s why I was drawn to science fiction. By creating more outré and stylized situations, it was possible to make bolder statements about human behavior. The problem with this conception of fiction, though, is that fiction is written by individual human beings. And, with a few exceptions, it’s written primarily through the exercise of a person’s intuition and personal observations of the world. And intuition and personal observation even when they’re being exercised by a literate and highly intelligent person, aren’t very good at figuring stuff out about the world. If they were, then Aristotle would’ve sorted everything out 2500 years ago, and we all could’ve relaxed. Art’s not like that. If art is about figuring things out, then it’s all hypothesis and no confirmation. Because figuring things out is great and all, but scientific truth is reductive. You see all this stuff around you? This physical matter that comes in so many shapes and colors and textures and tastes? Well, all that stuff is really just made of 100+ basic elements. And those elements are just combinations of three basic particles. And those particles are just…etc, etc. And nowhere is this more apparent than in the science of human behavior..
For instance, one of the hot things in human behavior is happiness research. And most happiness research operates off of this happiness survey that they give to people. A survey that, in essence, asks people to rate their own happiness on a scale of 1 to 10. Now, this is a pretty controversial tool, since who knows what the survey is actually measuring? However, as I understand it, there is some data (some of it based on brain scans) to suggest that peoples’ answers on this survey are correlated with what they’d call their subjective feeling of happiness. And, using this survey, it’s possible to draw some broad conclusions about what kinds of things make people happy and what kinds of things don’t make them happy (earning more than $75,000 a year doesn’t make you happy, but getting married does, for instance). However, when you really start to think about it, this paints a pretty bleak view of human existence. That’s because the broad range of human experience and behavior has been turned into a math problem. What thoughts and stimuli will make this number higher? And what will make it lower? Now, it’s certainly possible to create fiction that’s based on the struggle to solve this math problem. And I think that plenty of very good fiction has been written about that (most of Emile Zola’s work, for instance; and the work of both Thomas Mann and Fyodor Dostoyevsky contains very good analyses of various political, social , philosophical, and psychological attempts to either deal with or dispense with math problem). And one function of art, for me, is to rescue us from that thought process. Because life is not naturally a math problem. Life is naturally a really complicated and multi-faceted thing. And people do things for lots of reasons. And there are lots of strange things in it. For instance, I read an article in Slate the other day about tornado chasers. That was nuts! I couldn’t believe that this was an actual somewhat-organized hobby. I’d just assumed that most tornado videos were happenstance things. 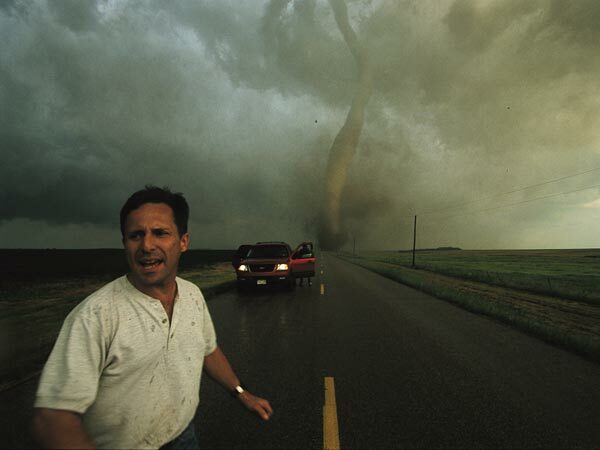 It’s possible to view tornado-chasing in happiness-optimization terms: the people are seeking the euphoria that arises as a biological response to facing danger; and they’re also seeking the social status that comes with being seen as bold people. But that also ignores the reality that these people CHASE TORNADOES. They listen on the radio and on Twitter and when they hear a report, they grab their cameras and hop in their SUVs and drive towards a whirling funnel of hundred mile an hour wind! Now why do they do that? All that stuff about happiness is true. But why do they chase tornadoes instead of playing Russian Roulette with each other (although I’m sure there’s a group of people who do that, too)? *I’m speaking to an idealized version of science here. In practice, things are more complicated. But at least science, unlike art, has ability to measure whether a statement is empirically true. Work is going extremely well! Interesting. If you’re into philosophy of science, you might get a kick out of Alva Noe’s “Out of Our Heads.” He suggests that there is something non-reducible about conscious experience, and that it is inextricably bound up in a physical context. Consciousness is not in our brain; it’s in the interaction between our brain and the world. It’s pretty trippy and awesome reading, and it seems relevant to this idea that the reductionist part of science misses some of the “oh man! that’s what it feels like to do that!” of human experience. Oh, awesome. I will put that on the list!